In the latest edition of the CNS Quarterly Magazine (Fall 2013) by the Congress of Neurological Surgeons, NeuroMind has been rated as the #1 iPhone application for neurosurgery. 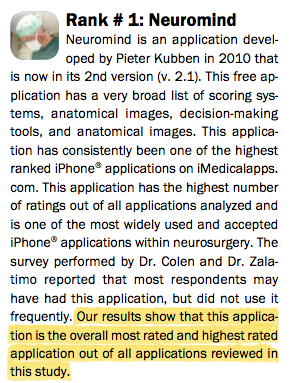 The authors state that “it is the overall most rated and highest rated application out of all applications reviewed” and that it is “one of the most widely used and accepted iPhone applications within neurosurgery“. Thanks to all of you for this excellent result!